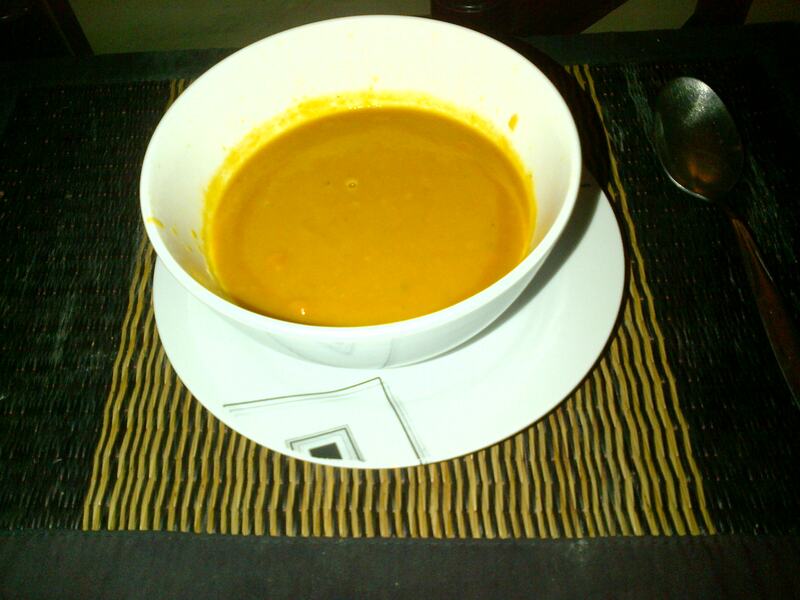 Home » Play » Food » Home remedies – sick chick soup! Home remedies – sick chick soup! I lost the battle! A nasty cold was ready to pounce even before I left Monday for Bangkok. A couple plane rides, killer air conditioning and sleep deprived day or two later, I returned home well and truly sick. Naturally as I’m a generous sort – my partner also is blessed with sniffles and cough. With only three sleeps to go before our big Canada trip, we knew we needed to up our ‘home remedy’ game. So in addition to the tried and true (list below), I also made a couple of soups. By Sunday, it was full-on comfort food craving time. Rummaged around the fridge and found carrots and ginger – and voila! A savoury Sunday soup for a ‘sick chick’! Pressure cook for about 15 mins. Once it cools a bit, blend into a nice relatively consistent soup. In my case, I don’t have a blender so did it in small batches in my all purpose wet & dry mini mixer, deliberately leaving a few chunks. If its too thick or just if you want, can dilute with orange juice or cream. Last step is to grate nutmeg to taste. If needed, add more salt n pepper too. Could accompany with crunchy baguette or croutons. However in our case, all we wanted was something warm, flavourful with ginger to sooth our sore throats. 2. 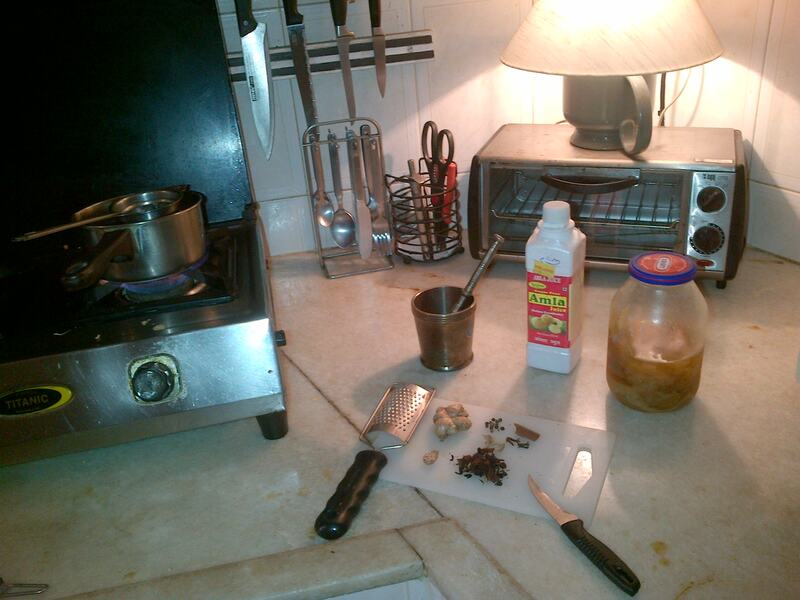 Chai with crushed black pepper, cloves, cinnamon, javitri (dried flower covering mace), grated ginger. Strain then add honey & lime. Naturally Old Monk rum or a cheap local whiskey can add a little medicinal kick! And no milk in this tea…. 3. Warm milk with turmeric or honey turmeric – yuck! 4. Amla aka Indian gooseberry– We have it in two forms. I prefer the tart concentrated liquid – one shot and I’m done! My partner prefers the fruit in a sweet sugar syrup. 6. Karvol steam inhalation. Only encountered these capsules in India tho certainly Vicks vapour rub was common in Canada. It’s a capsul of camphor, chlorothymol, eucalyptol, menthol which is dissolved in hot water. You then use a towel over the head and breath slowly and deeply in the steam. If your nose is initially blocked, this will open it for a bit! So to all my friends also suffering from monsoon sniffles – Get well soon! Would love to hear what does the trick to get you back on your feet quick?? By Carissa Hickling in Food, India on June 30, 2013 . Hope you won’t suffer too much on your flight… the pressure change sure is horrible when you’re all blocked up. Keep up your brilliant track record!! Evil germs should be kept at bay. Worst case, have some de-clogging stuff to knock me out with en route. I’ve travelled with a head cold before – you start miserable and end waaaaaaaay worse! Its not fun and best avoided. Here’s hoping will chase this nasty thing away before we step onto the plane Wed night! Fingers crossed and LOTS OF DECONGESTANT! I am a big fan of neo citron 🙂 get well soon! Oh yeah! This has got to be one of the only things I can’t locate here. So stock up on LemSip from Singapore (that’s the stash I’m on now!) or Neo Citron from Canada. Doing better today thankfully!! Try it with ginger! Its yum!! Thanks for the veggie recipe! I’ll try it sometime when I get sick (hopefully not too soon). All of the above with replacement of eucalyptus oil for Karvol inhalation. You can also rub some on your chest, sprinkle on a hanky and on the bedding to help clear and soothe those traumatized airways.